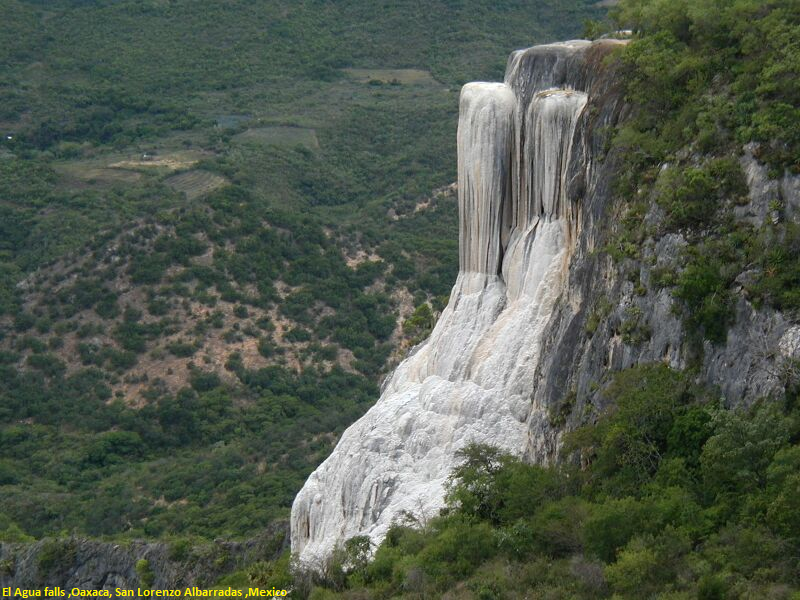 Hierve el Agua (Spanish for "the water boils") is a set of natural rock formations in the Mexican state of Oaxaca that resemble cascades of water. The site is located about 70 km east of Oaxaca city, past Mitla,in the municipality of San Lorenzo Albarradas, with a narrow, winding unpaved road leading to the site.The site consists of two rock shelves or cliffs which rise between 50 and 90 metres from the valley below, from which extend nearly white rock formations which look like waterfalls. In Public transport You can take a bus for $15 pesos or collectivo (taxis, minibuses or little trucks that are fitted out to carry people) to Mitla from the Estadio de Beisbol just outside of Oaxaca Centro for $20 pesos per person, this is about a 20 minute trip. Once you arrive at Mitla you can take a collectivo or man with a truck, they are normally holding "Hierve El Agua" signs for $50-60 pesos per person up the hill to Hierve El Agua and back to Mitla. This may take about 30-40 mins due to the road being unpaved and pretty steep. Upon return to Mitla, you catch a direct bus back to Oaxaca that will drop you at the Estadio de Beisbol for $15-20 pesos per person. This may not be the most comfortable ride but it's the cheapest option by far. You can also hire tour operators in Oaxaca city.Car sharing and car hire is also available.